I will always remember the summer of 1967. I was only 14 years old and blessed to reside in what was then one of the great cities of the world, Montréal, Canada. The city was experiencing a revival and huge building boom, including what was then the most modern subway in the world, the Metro. Riding on the Metro every day was fun, but the most exciting thing about Montréal that year was the World’s Fair, Expo 67. During the six-month duration of the exhibition, more than 50 million people visited the site, with its one hundred pavilions. Many of the earth’s nations participated, as well as many large corporations. And there were several pavilions that expressed different aspects of the overall theme, Terre des Hommes (“Man and his World”). It was an amazing expression of humanity’s greatest achievements and hopes, a true humanist masterpiece. With my summer passport that cost only $35 if I remember correctly, I spent that entire summer at Expo 67. It was my first experience of global consciousness. 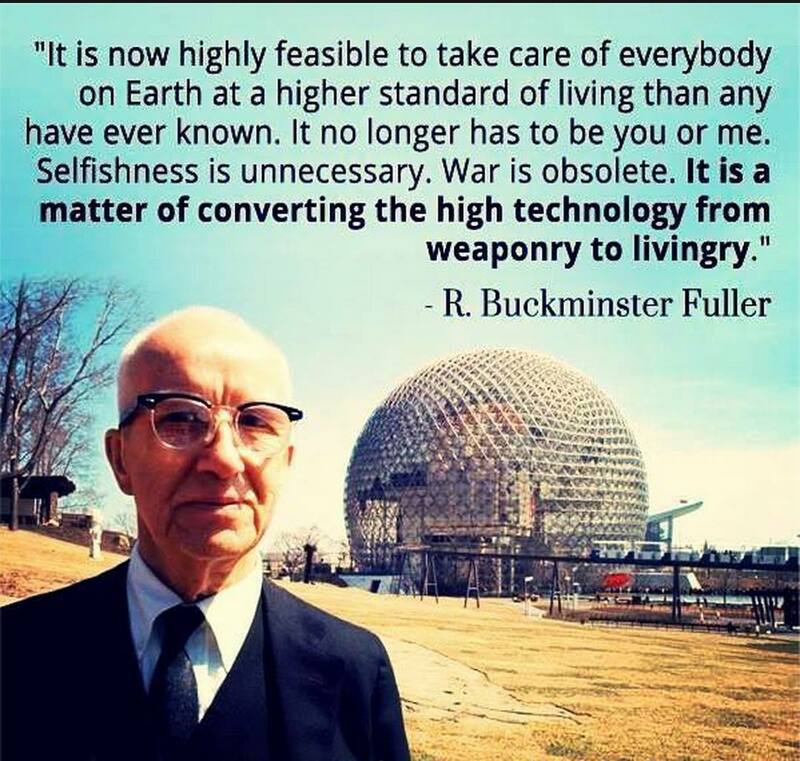 And Buckminster Fuller was one of the architects of my dawning global consciousness. It was the time of the Cold War. In a brilliant stroke of genius, the pavilions of the US and the USSR at Expo 67 faced each other across the St. Lawrence River on the two islands that made up the exhibition site. People commented on the huge difference between the two pavilions. The USSR pavilion pulled all the stops in its ambition to show the industrial, technological and space achievements of Soviet communism. The US pavilion featured some space exhibits, but most of all it was an expression of down-home Americana. People made fun of the contrast between the Soviet displays of technological propaganda and the Americans displays of antique dolls, Hollywood and pop-art posters, and Elvis Presley’s guitar! Only an old Gemini capsule and its parachutes competed with the Soviet displays of space achievements. The Soviet pavilion with its sloping roof and faceless exterior sits across the water from the US geodesic dome designed by Buckminster Fuller. The architecture of the two pavilions also demonstrated a profound difference. The USSR pavilion was a mammoth, utilitarian building, perfectly in keeping with the contents chosen to maximize the impact of Soviet propaganda. The American pavilion was a geodesic dome designed by Buckminster Fuller. The contrast couldn’t have been greater, as the two pavilions faced each other across the water. Buckminster Fuller (1895-1983) was one of the great Americans of the 20th century, a genius and true renaissance man: architect, inventor, environmentalist, futurist – a true thinker and doer! He was awarded the Presidential Medal of Freedom by President Reagan in 1983. The geodesic dome that he designed for the US pavilion remains to this day the most lasting legacy of that summer. Fuller was also a philosopher, with a positive vision of human life on earth. His geodesic dome at Expo 67 best expressed his global thinking. Here he is shown in front of the US pavilion shortly before Expo 67 opened its doors on April of that year. The quote is typical of the man’s vision. (Click the image to enlarge it.) But it’s a vision that seems even more remote today, as the rich get richer and the poor get poorer, and war is everywhere. Daily images of terrorist acts and refugees risking death to escape hopeless existence remind us that we are very far from Fuller’s optimism. And yet optimistic we must remain. Giving in to despair will only increase the forces of evil. The dual mission of the Christian church is simply stated: We are here to present a message of hope; hope rooted in the gospel of Jesus Christ and his vision of a renewed human existence. But alongside this message of hope and optimism we are also to openly confront the evils that are all around us, with boldness and honesty, with anger but not with guns and hatred. Our message of hope does not close our eyes to the evils that afflict human existence. I love his phrase, “average healthy human,” and what such a person can achieve that nations, religions and corporations cannot. Throughout most of its history, the Christian church has behaved like a great nation, a great religion, and, in more recent times, like a great corporation. This is a fact, uncomfortable perhaps but impossible to refute. The early Christians confronted the evils of the Roman Empire with the gospel weapons of truth and hope. They were average, healthy human beings, and the church was made up of such as these. Their quiet resistance to the Roman Empire brought something totally new to the world. As soon as the Emperor Constantine won his military victory under the “sign of the cross” the church began its long trek as a nation, a religion, a corporation even. Contrary to the common view of history, I say that it wasn’t Constantine’s conversion that defeated the Roman Empire, but the quiet witness and resistance of those humble, healthy men and women. They are the “cloud of witnesses” that the Epistle to the Hebrews (12:1) speaks of. Paul Farmer, founder and chief representative of Partners in Health, is one of the great men of today. I love what Tracy Kidder wrote about one of his books. These words should be said of everyone who considers him/herself a Christian: “This is an angry and a hopeful book, and, like everything Dr. Farmer has written, it has both passion and authority.” Do you see how these go together: anger and hope, passion and authority? Christians get angry about all the wrong things and our hope is usually tied to outmoded ways of thinking. We have no passion for the things that God is passionate about, and hence we do not speak with authority and no one pays attention to us. Hard truths, but truths nevertheless. Fuller saw himself not as a great inventor and architect, but as an “average healthy human.” And I’m sure Paul Farmer thinks of himself in those terms as well. Average, not mediocre; healthy in mind and body, working for the spiritual and physical health and wellbeing of the world; human, human enough to care for the humanity of others. I read these words and I see a good summary of what my own life should be. I see what the church should be. The church is made up of us, so if more of us strove to be average, healthy and human, perhaps the world would be a better place. Let’s stop supporting the cheap celebrity culture; let’s stop trying to turn the church into another celebrity. Let’s honor the great cloud of witnesses of the ancient past; and let’s honor the great cloud of today’s witnesses who strive to be average, healthy and human. It’s the way of Jesus. 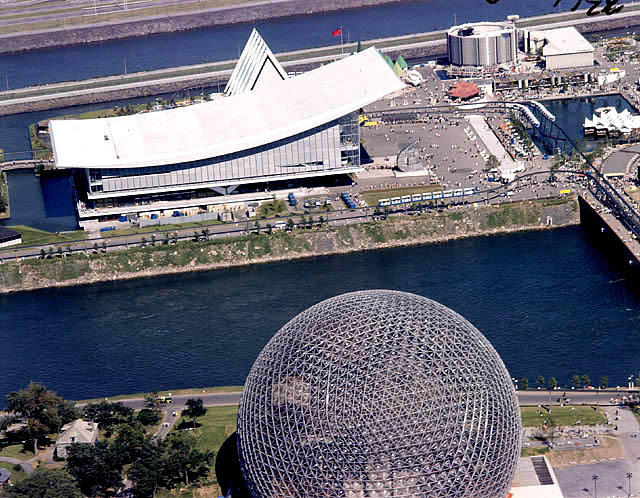 Categories: Global Visions | Tags: Buckminster Fuller, Expo 67, geodesic dome, global consciousness, Paul Farmer | Permalink.